The species is widespread in Britain, but more scattered in the west and north. A Holarctic species that is widely distributed in western and central Europe. The species is found on low, especially dry or dead vegetation (Jones 1983), in rough grassland or herbage growing at the edges of fields, hedges and woodland rides. It spins its web in the tops of plants which supply rigidity and suitable structural spaces. The old heads of various umbellifers, docks, thistles and plants like Hypericum are favoured situations. On heathland the spider is very common on heather. The spider is not deterred by the prey's size, which is always bitten in the leg until dead. Adults occur from late spring to mid-summer. 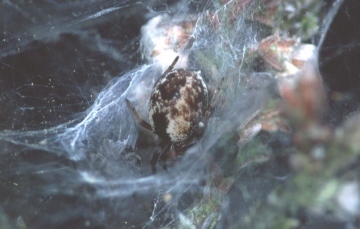 In June the male seems to stay for a month or more in the female's web where they both live in a rough chamber with several openings (Bristowe 1958). A common spider, but Bristowe (1958) states it has seldom been found in Wales and Bell (2000) comments on its patchy and rare occurrence at a local level in Shropshire.